One of the causes of glaucoma and blindness is an increase in intraocular pressure, or pressure inside your eye when liquids in it can't drain off as well as they once did. There are eye drops which can help, but now companies are working on tiny implants that'll be able to assist the body in shunting off the extra aqueous humour to where it's meant to go. At this year's meeting of the American Academy of Ophthalmology/Asia-Pacific Academy of Ophthalmology, researchers described the results of trials on one of these devices in detail. 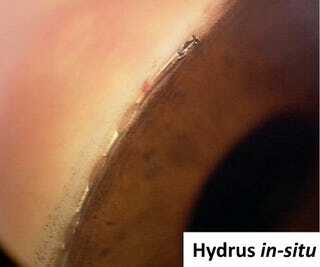 The Hydrus Microstent is around the size of an eyelash, and can be implanted in a procedure as straightforward as a cataract operation. In a study of 69 patients with mild to moderate open-angle glaucoma, all of them saw a reduction of intraocular pressure to "acceptable levels". What's even more intriguing is that this is just one device of a whole cluster of miniaturized stents that are currently undergoing clinical trials. We're taking an existing medical technology and practice, and shrinking it down to tiny sizes in order to radically alter a major and fairly common disease. What's the bet that soon you'll be able to get these implanted at the first signs of glaucoma, and save yourself years of lost sight?